These hanger spacers keep clothing evenly spaced, unwrinkled, and easy to see. If your closet is overstuffed, having these organizers might even motivate you to pare down to your favorite pieces and donate the rest. Use Xangars in your entire closet or just in a section for formal wear, dry cleaned clothes, or winter coats. Since only a finite number of the spacers fits on any given clothes pole, the purchasers of this product have the "opportunity" to pare down their wardrobes and consign or donate whatever number of items don't fit! Thank you very much for the product. Have been looking for these for years. Great product and great service from Grommet. Will reorder soon. Many of us could use more zen in our lives—and our surroundings are a great place to start. 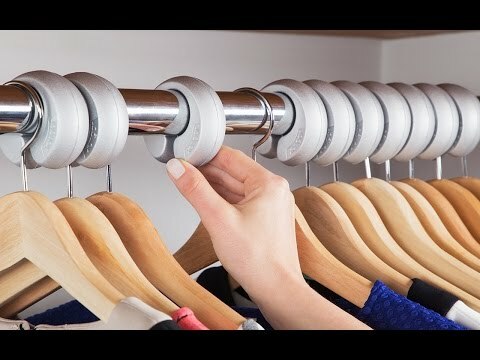 Hanger spacers by Xangar will motivate you to pare down your overstuffed closets, and create an organized, appealing space. Mother-daughter duo Debi and Brittany Bell came up with the idea, prompted by Debi’s seemingly endless searches for items in her messy closet. These flexible dividers fit over most clothing rods, sliding smoothly back and forth for easy rearranging. Use it for your entire wardrobe or to keep specialty pieces (formal dresses, dry cleaned business attire, winter coats) separate and unwrinkled. When you can see—and find—everything, you’ll find that having a peaceful closet promotes a peaceful mind.